Fort Chanwa Luni is Rajasthan heritage hotels at its best. With period furniture, beautiful furnishings exemplifying the region and beautiful paintings, Fort Chanwa is an authentic Rajasthani heritage experience. Kaviraj Muraridanji, an astute administrator in the court of Maharaja Jaswant Singh II Ruler of Jodhpur Marwar from 1876-1895 A.D, was the owner and builder of Fort Chanwa, a charming fortress palace. After his death, Fort Chanwa reverted to the state and was granted to Maharaja Dalip Singh, the youngest son of Maharaja Umaid Singh in 1948. Now restored to its original glory, it has been run has a very successful heritage hotel since 1992 by its owners Maharaj Dalip Singh & Rani Madhu Devi. Enjoy the personal hospitality of the royal family during your stay at Fort Chanwa. Made entirely with red sand stone, Fort Chanwa has latticework windows or jharokas. It has an amazing architectural plan; the fort is a maze of accurately planned stairways, secret rooms, corridors, passages, towers and rooftop. 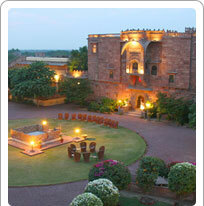 Fort Chanwa has forty five rooms, each with authentic decor, different from the other. All the modern luxuries are standard. The guests can savour traditional Rajasthani cuisine specially prepared by the cooks who have been with the royal family through the generations. Enjoy candle-light dinners with folk musicians singing in the background.